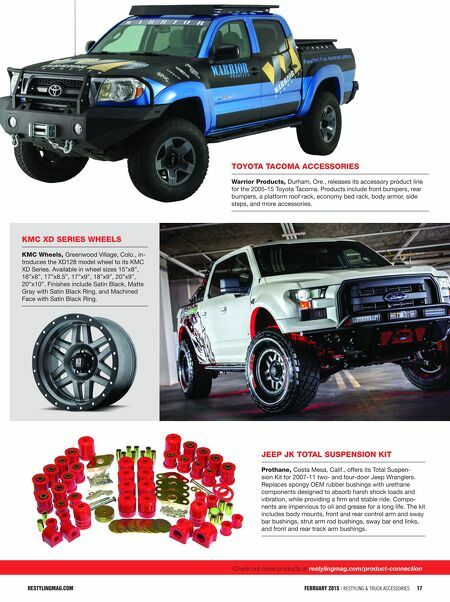 16 Restyling & tRuck AccessoRies | FEBRUARY 2015 restylingmag.com Tell them you saw their product in Restyling & Truck Accessories Magazine! Softride coil SpringS Skyjacker Suspensions, West Monroe, La., debuts Softride Coil Springs for the Jeep JK. FMVSS compliant and available in 2" and 4" applications for two- and four- door models. Engineered to maintain ride quality, while also providing key features needed for offroad durability. Capable in rough terrain and ideal when ride quality and long lasting comfort is the peak concern. Made in the U.S.A. All pUrpoSe MUd terrAin tire Mickey thompson performance tires & Wheels, Stow, Ohio, debuts the Deegan 38 tire. The all-purpose mud terrain tire with aggressive style and performance was designed in cooperation with racing icon Brian Deegan. Features solid white "DEEGAN 38" lettering on 15", 16", 17" and 18" sizes—stylized black sidewall on 20" sizes. Includes wide outer-voids for self cleaning and aggres- sive looks, tight inner void sections for reduced noise and greater contact area, and generous siping for all-season performance. SerieS tr1 WHeel Hre Wheels, San Diego, launches the Series TR1 wheel. Features signature Monoblok technol- ogy and conical profiles. 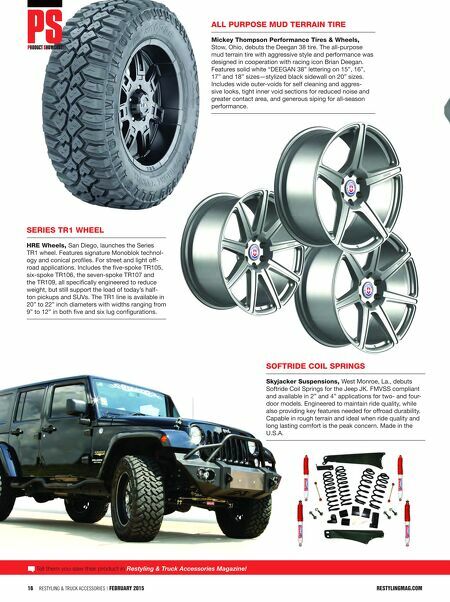 For street and light off- road applications. Includes the five-spoke TR105, six-spoke TR106, the seven-spoke TR107 and the TR109, all specifically engineered to reduce weight, but still support the load of today's half- ton pickups and SUVs. The TR1 line is available in 20" to 22" inch diameters with widths ranging from 9" to 12" in both five and six lug configurations.